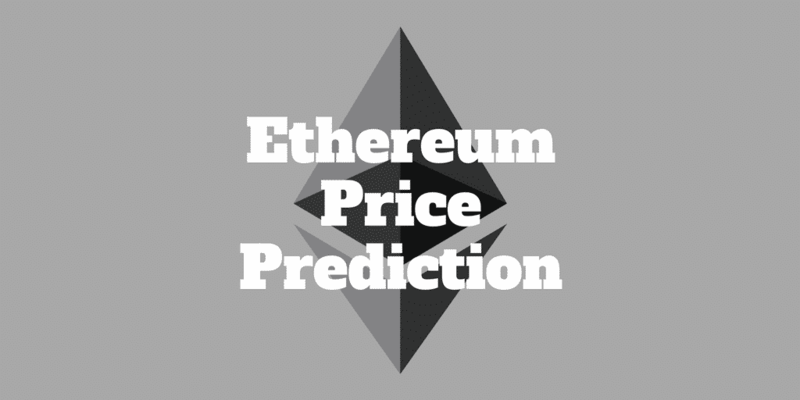 Although it is foolhardy to make an Ethereum price prediction with confidence, it may be possible to forecast future prices using various analytic methods. Whether conventional technical analysis, Monte Carlo simulations, or market capitalization comparisons, we explore what the future holds for the price of Ethereum. But in order to make price forecasts for Ethereum, we first need to see how and why it is different to the original cryptocurrency, Bitcoin. Bitcoin may have sparked the cryptocurrency revolution but Ethereum may have greater longevity, which in turn could bode well for forecasters brave enough to make an Ethereum price prediction. While Bitcoin gained popularity as a cryptocurrency that could supplant conventional currencies, like U.S. dollars, euros, and yen, Ethereum has received attention because it has the possibility for broader use beyond payments. The best way to think of Ethereum is as a general purpose platform upon which other applications can be built. Similar to how Apple and Microsoft built operating systems that supported a wide range of software from spreadsheets to budgeting tools, so too can Ethereum support a range of applications related to blockchain technology. The big difference between Bitcoin and Ethereum is that developers are permitted to build applications on top of Ethereum’s blockchain technology but they are restricted from doing so on top Bitcoin’s technology. By catering to developers, Ethereum is responsible for the majority of initial coin offerings and its currency has earned a reputation for being robust in the face of cyber attacks. But with hundreds of cryptocurrencies in existence, what does the future hold for Ethereum and what Ethereum price prediction can be forecast? Most cryptocurrencies impose a limit on the number of coins issued over a specific time period. Bitcoin has a limited supply of 21 million coins, which are due to be mined by the year 2040, while Litecoin has a total supply of 84 million coins. Unlike Bitcoin and Litecoin, Ethereum does not have a fixed supply of coins. The supply of ethers, the name given to Ethereum’s currency, is not limited but the issuance is capped at 18 million ether per year, which represents approximately one quarter of the initial supply. By issuing a fixed number of ethers annually, relative inflation declines each year. Ethereum borrows significantly from Bitcoin’s protocol and blockchain design but is significantly different because it supports applications beyond money. Like Bitcoin, Ethereum has a blockchain structure that has a record of transaction history. But unlike Bitcoin, Ethereum uses accounts much like bank accounts whereby ether tokens are stored in digital wallets and can be transferred to other accounts. By contrast, Bitcoin figures out how much of the digital currency someone has by tracking unspent transactions. Where Ethereum shines compared to Bitcoin is the flexibility it provides to programmers, who can create programs whereby blockchain transactions automate and control various outcomes. So, if Ethereum has more flexibility compared to Bitcoin and is more resilient to cyberattacks, what Ethereum price predictions can be forecast? John Young, founder of Spreadsheet.io, analyzed Ethereum using Monte Carlo analysis. The idea behind Monte Carlo analysis is to use randomness to solve problems that may be deterministic. Monte Carlo experiments rely on repeated random sampling to obtain results, which is why the graphs below look a little chaotic! In order to make an Ethereum price prediction, he used historical prices for Ethereum, calculated daily returns and daily range, and simulated outcomes over single year and multi-year durations. A geometric Brownian motion model was used to make Ethereum price predictions that led to a minimum price forecast of $40 and a maximum price forecast of $3,004 with a mean of $829 with 95% confidence. If you stretch that to 99%, the maximum value could rise as high as $8,487 but eagle-eyed statisticians may find this analysis troublesome. The premise beyond the analysis is that the underlying process is stationary and well behaved but the real world tends to produce long tails that break sophisticated models! Just ask the team who founded the infamous hedge fund, Long Term Capital Management. The team of Nobel prize winners believed they had a foolproof model to make money but neglected to factor in extremely rare price movements that subsequently occurred and ultimately blew up their hedge fund and nearly took down the world economy too. So even though it is common to model the progression of asset prices as a stochastic process with drift and a random Brownian term, and changes are assumed to be normally or lognormally distributed, the reality is cryptocurrency price movements are characterized by spikes and plunges. 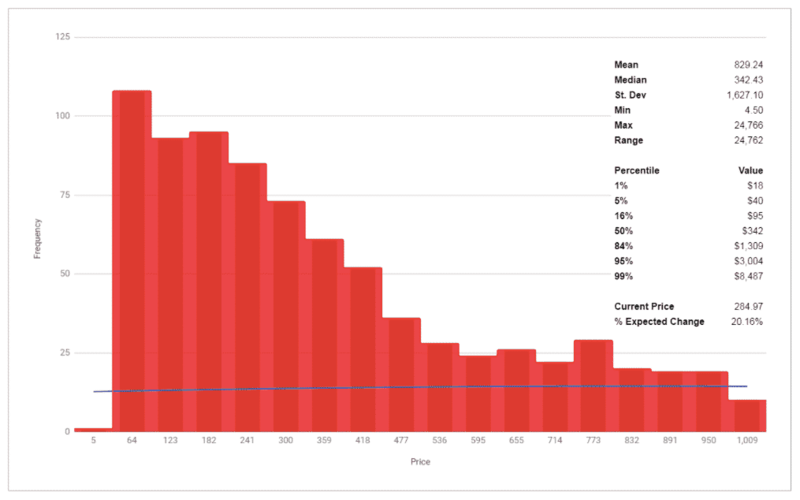 The broad price range from a minimum of $40 to a maximum of $3,004 is due to the fact the model is calibrated to past data. And it wouldn’t be an outlandish argument to suggest that a price range so wide is not especially helpful anyway in narrowing down an Ethereum price prediction. 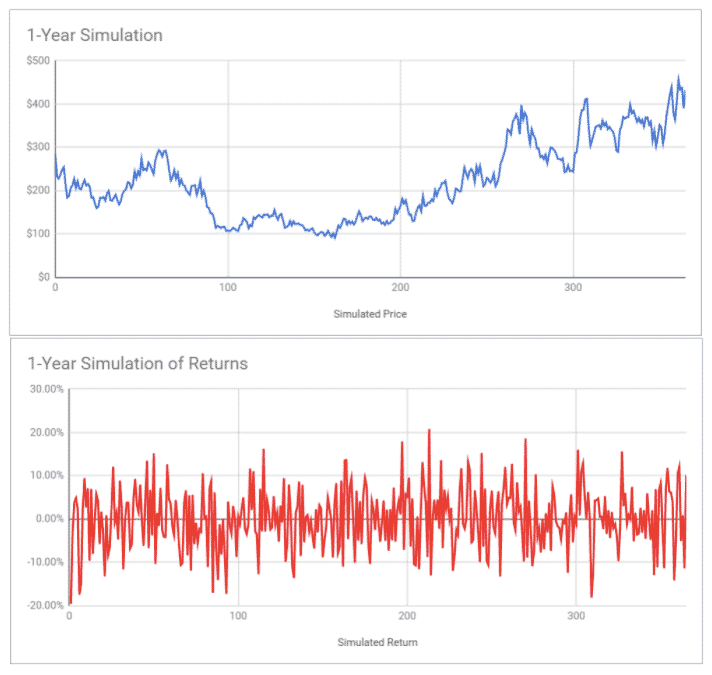 Still, few good tools exist to make good cryptocurrency price predictions due to the significant price volatility from one day to the next, so Monte Carlo simulations may prove to be one of the best. But are there other ways to make Ethereum price predictions? Another way to forecast the future price of Ethereum is to use classical technical analysis. Technical analysis is a tool used to forecast future price movements by analyzing data from trading activity, such as price and volume. By viewing an Ethereum price chart, a prediction can be made by extending an uptrending mean price line. When applying this method at the time of writing, the 1-year forecast for Ethereum would place the price at $1,872 U.S. dollars and the 5-year price forecast would result in a price of $4,721. As with any technical analysis price chart forecast, no guarantees exist that past price movement will be indicative of future price movement. Another way to make price forecasts is to compare Ethereum with Apple and Microsoft. If Ethereum is the “operating system” upon which future blockchain applications are built, it could be compared to Apple and Microsoft, which built the two primary computer operating systems used worldwide. The combined market capitalizations of Apple and Microsoft are approximately $1.5 trillion at the time of writing whereas Ethereum had a market capitalization just north of $100 billion. If Ethereum were to realize its potential as the platform upon which all future blockchain technologies were built perhaps its price rise has a significant runway ahead of it yet. But Apple and Microsoft produce real products and have real customers that pay them year after year so it is difficult to make a like-for-like comparison. And it would be a bold claim to infer that Ethereum could grow to a market capitalization as large as $1.5 trillion. The expectation of capturing future value is largely what has catapulted the price of Ethereum and other cryptocurrencies higher. Whether they will sustain their valuations and continue to grow will depend on how closely expectations match reality. John McAfee became famous as the founder of McAfee anti-virus software but more recently he has jumped on the cryptocurrency bandwagon with gusto. As one of the leading cryptocurrency miners in the United States, he has predicted a rise in Bitcoin to $1,000,000 per coin by 2020. If Ethereum were to rise in price by the same amount, it would translate to a 50x increase, which would seem to defy reason because that would equate to a market capitalization of $5.7 trillion! While that may seem outlandish, McAfee does make the case for blockchain technology and cryptocurrencies in the video below. On the other side of the argument is Warren Buffett, who encouraged investors to “stay away” from Bitcoin in 2014 before its meteoric rise. Buffett may end up being right in the end when he stated that Bitcoin is a “mirage” but so far the cryptocurrency market is leaving him with egg on his face. His argument is based on the fact that you “can’t value Bitcoin because it’s not a value-producing asset” which means it doesn’t produce a dividend. Without a dividend, financial analysts cannot apply standard financial models to make price forecasts. Critics of Buffett would argue that he doesn’t have a great record betting on technology companies and historically has shunned them so he may not be the best qualified observer of the cryptocurrency market. Still, he didn’t amass billions of dollars without having a good idea of what assets in the world are worth investing in and which are undervalued, so it may be best to keep an open mind even if you are upbeat about the prospect for digital currencies. The price volatility of cryptocurrencies has historically been so high that making accurate price predictions is a near impossible game. Expert miners like John McAfee predict Bitcoin will rise to a value of $1 million per coin while one of the richest investors in the world, Warren Buffett, made a bleak assessment of digital currencies because they don’t pay dividends making them virtually impossible to value. If you were to apply conventional technical analysis to Ethereum, it has a 1 year upside price potential of $1,872 at the time of writing while Monte Carlo simulations show a price range from $40 to $3,004. Some advocates for cryptocurrencies believe they will take market share away from conventional currencies but even then it is hard to gauge precisely what percentage is likely. The bottom line is making an Ethereum price prediction with high confidence is virtually impossible so if you do decide to take the plunge into the world of digital currencies, it is well worth sitting down with a Chartered Financial Professional or financial advisor before risking your hard-earned savings. Have you traded cryptocurrencies? What is your Ethereum price prediction for the next year? ‹ Ellevest Review 2019 – Invest Like A Woman!